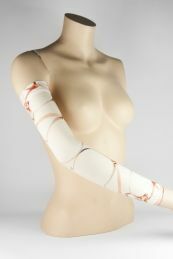 The LINDNER compression arm sleeves are used for treatment of lymphedema of the stages 1 and 2 and in venous disease. Due to their anatomical shaping the formation of wrinkles in the elbow is minimized. Their lightweight and skin-friendly material gives you the ultimate in comfort. The products used for the treatment of patients. Wear your compression arm sleeve only after the consultation of your doctor. All LINDNER products are subject to product testing within our quality management system. Should you have any complaints about our product, we ask you to contact your dealer or us. LINDNER All products are subject to product testing within our quality management system. Should you have any complaints about our product, we ask you to contact your dealer or us.